Several streets were flooded and blocked off from traffic in the Kansas City area on Tuesday after overnight rains pounded the region, prompting numerous rescues of stranded motorists and others who scrambled to safety atop rooftops. Kansas City's police and fire departments reported receiving more than 130 calls for water rescues, with dozens of others fielded in the suburbs. There were no immediate reports of deaths linked to the deluge, which the National Weather Service said dumped record-breaking rainfall in some areas. As much as 9 inches of rain on one city neighborhood between Monday night and Tuesday morning. A large swath of the region saw 4 to 6 inches. In the suburb of Overland Park, Kansas, fire officials said three adults, four children and at least one pet sought safety on the roof of a house after flooding along the Blue River inundated the home. 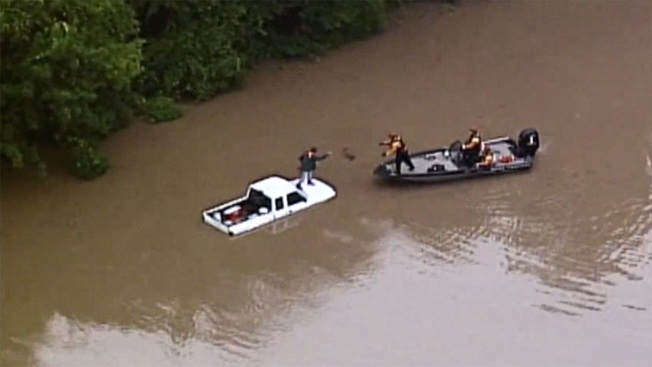 As of Tuesday morning, firefighters said those victims remained perched but calm and safe atop the home, with rescue crews waiting for the flooding to recede before evacuating them. In Kansas City, Missouri, rescuers early Tuesday pulled a woman who sought refuge in a tree. Authorities said she had been watching flooding along the Indian Creek from her vehicle when the waters flipped her car and pinned it against the tree. Portions of the creek rose to nearly 3 feet above the previous record from June 2010, according to the National Weather Service. But river levels were quickly receding Tuesday across the region, according to the weather service's website. The flooding prompted several schools in the region to either cancel Tuesday's classes or delay the start of them. In some cases, schools cited busing issues linked to the flooding.